A Dominican baby with one of the world's rarest birth defects has died, hours after doctors removed the infant's second head. Hospital officials in Santo Domingo say seven-week-old Rebeca Martinez died Saturday after her blood refused to clot. The baby girl had stable vital signs after surgery late Friday, but doctors had warned there was still the risk of infection or hemorrhaging. 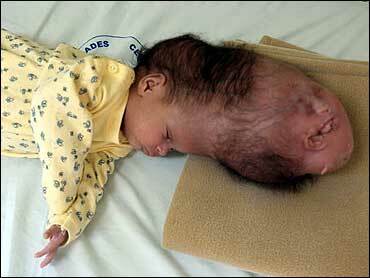 Rebeca was only the eighth documented case in the world of a baby having the head of an undeveloped twin attached to the top of its skull, and the first to have surgery to remove the growth. A team of 18 doctors spent 11 hours operating on Rebeca to separate her from the second head, which threatened the girl's development. A U.S. - based charity that provides medical aid to children in developing countries paid $100,000 to finance the surgery. The operation was prolonged because the extra tissue attached to Rebeca's head included arteries, which had to be cut extremely carefully, to avoid hemorrhage. Bone and skin from the undeveloped head were used to close the hole in the infant's skull left by the first phase of the operation. Its a cold decision to make, but deformed babies should be handled the same way as the ancient Greeks would have. When physically or mentally impaired children were born, the parents were faced with a difficult decision. They could raise their handicapped child to try and reach adulthood, or they could dispose of the infant by either killing it or leaving it exposed to the elements to die. This act of killing newborn children is known as infanticide and was a common practice in the ancient world, especially in Athens and Sparta (Edwards, 1). There are only a few ancient sources that discuss the topic of infanticide; these coming from Plato, Aristotle, Plutarch, and Soranus. Plato describes a utopia of sorts in his Republic and states that the offspring of healthy parents were raised, while the progeny from inferior parents were secreted away (460C). Aristotle takes a more drastic and harsh view stating, "As to exposing or rearing the children born, let there be a law that no deformed child shall be reared " (Politics, 1335B). In his account of Lycurgus, Plutarch makes reference to the Spartan system of examining and rearing newborn children. The newborns were examined by the elders of society and if the babies were deemed to be healthy and strong, they were ordered to be reared. If the child was deformed or weak, they were sent to a ravine at the foot of a mountain to die. Spartans believed that one with a disability from birth would be disadvantageous to the state. The final example from ancient sources comes from Soranus' Gynecology. A set of criteria was listed to decide whether a child was worth rearing (2.6). Some of these requirements were the mother's health during the pregnancy, length of pregnancy, the strength of the child's cry, and having complete body parts. Head to head with Boas: Did he err on the plasticity of head form?